1. Place the APC shelves (AR8128BLK)and the StarTech rack (4POSTRACKBK)in your shopping cart at CDW-G.
2. Think to yourself, before placing the order, "Hmmm ... 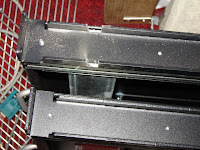 I wonder whether these APC sliding shelves will work in the StarTech rack. I'd better find out." 3. Call your CDW-G rep.
4. Receive verification from APC (by way of your CDW-G rep.) that AR8128BLK will, indeed, work in 4POSTRACKBK. 6. Expect the order to come much later than it does. But rejoice in its early arrival. 8. Unpack the shelves, and groan with disappointment -- these shelves will obviously not work. 10. 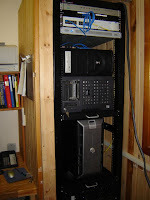 Return the next day, and modify the shelves (see photo #1). Hey, it's not pretty, but it works. 11. Complete assembly with the assistance of your spouse (or, if you do not have a spouse, a good friend) -- see photo #2. 12. Go home. Watch football. Create 12-step tutorial for installing APC sliding shelves in a StarTech four-post rack.